Google has quietly rolled out two new features in account settings that give you a quick overview of everything going on with your account security. The security dashboard shows all your important security settings, and the recent activity page tracks account sign-in history. These features could potentially help users track down suspicious behavior in a snap. The security dashboard tells you how long ago you changed your password, what your account recovery options are, how you receive notifications, 2-step verification status, and lists your connected apps. Each of these sections has a link to update or change the setting, and another to find related information. 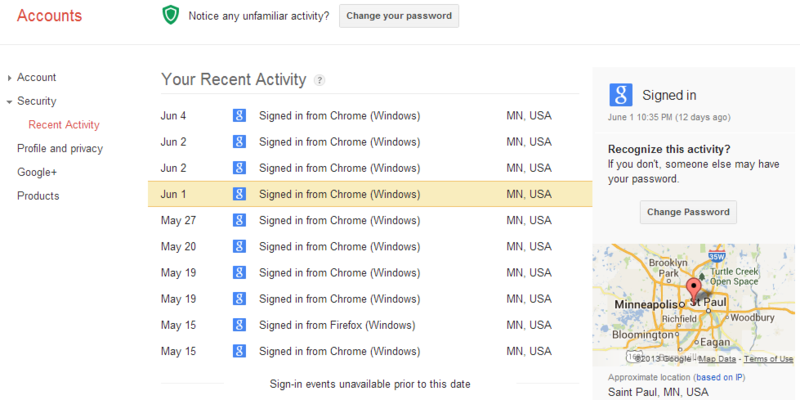 The sign-in tracker is a little bit like the Gmail feature we've had forever, but this is for the Google account itself. It shows all the log-in dates and approximate locations (based on IP address). Mine looks a bit odd... there might still be some bugs to work out. If something looks fishy, Google provides a link to change your password right there. Good stuff all around. If nothing else, you can sleep a little easier now.